Mexico does not exactly rush to get a new president into power after an election. Andrés Manuel López Obrador won in a landslide on July 1st, yet he takes office only on December 1st. The five-month transition has left ample time for fretting about the prospects for the relationship between Mexico and the United States when a right-wing nationalist is in charge north of the border and a left-wing populist leads in the south. A lot is at stake. The border is nearly 2,000 miles (3,200km) long; 1m people cross it each day. Some 35m people of Mexican origin live in the United States. Vital economic ties depend on good neighbourliness, as does co-operation on sensitive topics from controlling immigration to combating drugs-trafficking. President Donald Trump’s enthusiasm for building a wall along the border and his talk of “rapists” arriving from Mexico fire up his supporters at home but appalled his neighbours. Nowhere has approval of the United States fallen as much as in Mexico. In 2016, at the end of Barack Obama’s presidency, 66% of Mexicans had a favourable view of the United States, according to the Pew Research Centre’s polling; this has dropped to 32%. Just 6% of Mexicans have confidence in Mr Trump. In April, in reaction to the Trump administration’s separation of migrant children from their families, the Mexican senate called for an end to co-operation on security and migration. Then Mexicans elected the country’s most left-wing leader in decades. Mr López Obrador, who is often called AMLO, has a largely domestic agenda and little experience of, or apparent interest in, the United States. Diplomats on both sides reckon that relations between the two countries, already damaged by Mr Trump, could deteriorate further. How real are those worries? History casts a shadow over the way the two countries see one another. Mexico lost half its territory to the United States in a war in 1846-48. For the best part of a century the relationship was confrontational and distrustful. Relations improved during the second world war, when Mexico took the side of the Allied powers. But the countries remained “distant neighbours”, as a book published in 1985 described them. They clashed over Central America, and in 1985 over the abduction, torture and murder in Mexico of an American undercover anti-drugs agent, Enrique Camarena, the hero in Netflix’s latest series of “Narcos”. Then came a sharp shift. 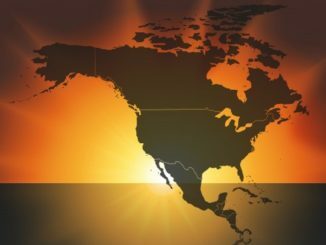 It started with market reforms in Mexico and negotiations from 1991 on a North American Free Trade Agreement (NAFTA) with the United States and Canada. NAFTA came into effect in 1994. After the 9/11 terrorist attacks in 2001, the two countries began to co-operate more on security. “An understanding started to develop that there was a true strategic connection between Mexico and the United States,” says Arturo Sarukhan, a former Mexican ambassador to Washington. The Mérida Initiative of 2007 saw tackling drug-trafficking as a “shared responsibility” (a vivid example today is the trial in a Brooklyn courtroom of Joaquín “El Chapo” Guzmán of the Sinaloa drug gang). The two countries worked increasingly closely on fighting organised crime, and on strengthening law-enforcement and justice institutions in Mexico. They now share passenger data on flights between them. Senior officials from the two administrations took to meeting every six months or so on a wide range of issues. Even military ties, unthinkable since 1848 and still sensitive in Mexico, started to develop. “Never before in the history of these two countries had they worked together so closely in so many areas,” says Anthony Wayne, a former American ambassador to Mexico. It is this intensity of interaction that is now under threat. The first 18 months of the Trump presidency were a “really dark period” for relations, says one American critic. The regular high-level meetings of officials petered out, provocative rhetoric roared in. Now Mexico will have a nationalist in power, too. Yet there are reasons to believe that the close ties will prove resilient. First, the relationship between Mr Trump and Mr López Obrador has got off to a surprisingly positive start. They exchanged warm letters. Mr López Obrador stressed that both of them had fought the establishment and won. Mr Trump is said to refer to him privately as “Juan Trump”. “As long as they don’t think they’re going to become friends, they may get along well,” says Andrew Selee, author of a recent book, “Vanishing Frontiers”, on the forces driving Mexico and the United States closer together. Mr López Obrador has been careful to avoid provoking Mr Trump. It helps that Mr López Obrador was such a clear winner and that his party, Morena, secured majorities in both chambers of congress. That trade pact is a second reason to hope that relations between the neighbours are not about to enter a new dark age. As long as a threat hung over NAFTA, which Mr Trump called “the single worst trade deal ever approved”, there was a chance of a rupture. But Mr López Obrador was keen to get the issue out of the way before taking office. That an accord came first with Mexico—before Canada—was striking. The relabelled United States-Mexico-Canada Agreement (USMCA), due to be signed on November 30th, will need ratification by America’s new Congress next year (not a foregone conclusion). For Mexico, some of its provisions bring constraints: a rule that 40-45% of final car assembly must be done by workers earning an average of at least $16 an hour may discourage investment in Mexico. But the USMCA is a lot better than no deal at all. It will preserve a relationship that is more interdependent than many Americans realise. Trade has blossomed (see chart 1). For the United States, Mexico is the second-largest export market, behind only Canada. American exports to Mexico are worth more than sales to Brazil, Russia, India and China combined. About 80% of Mexico’s exports go to the United States. Many of these goods contain American content heading back after processing. Intricate supply chains link the two countries. Under NAFTA, foreign direct investment (FDI) boomed: the stock of American investment in Mexico grew from $17bn in 1994 to $110bn in 2017. 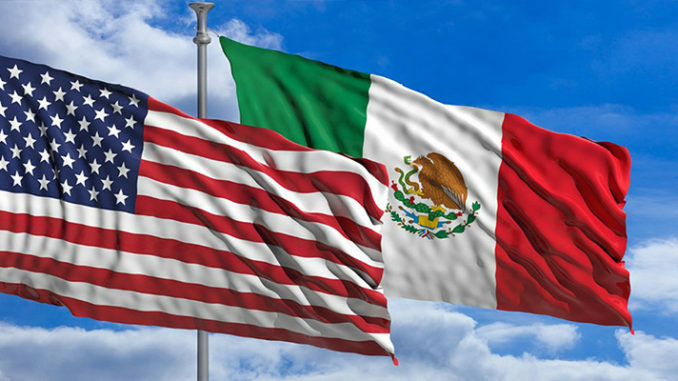 From a much lower base the stock of Mexican FDI in America rose more than eight-fold. 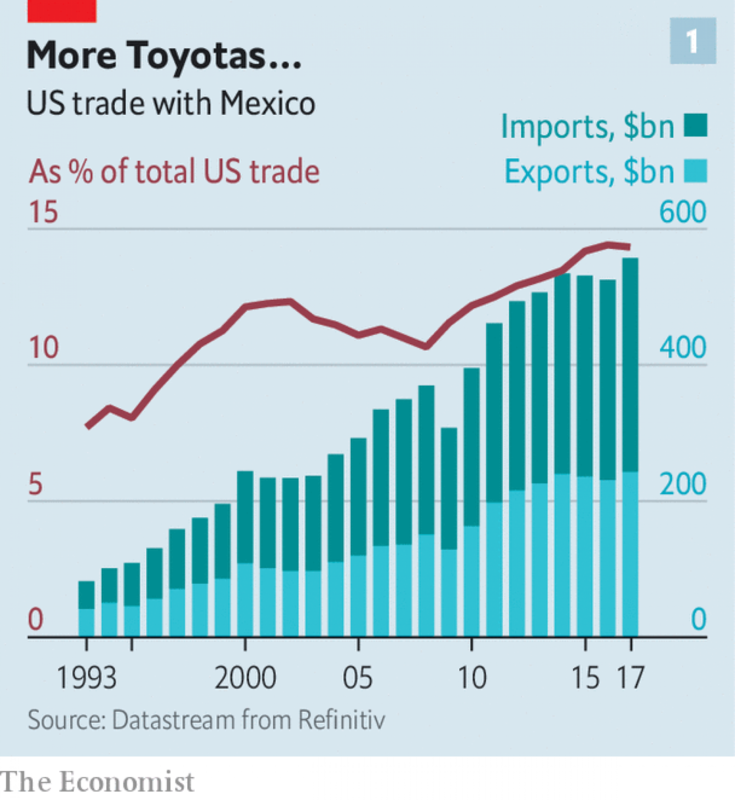 Trade has helped Mexico modernise, with big implications for a third area of the relationship: migration. Illegal migrants crossing the border are no longer mainly Mexicans. In 2000, of the 1.6m migrants apprehended, 90% were Mexican. There were just 311,000 apprehensions in the year ending in September 2017; and well under half involved Mexicans (see chart 2). More illegal migrants are now Central Americans who make their way through Mexico. The migrant “caravan” that began in Honduras and headed slowly north towards the American border during the recent mid-term election campaign reflects this new reality. Mr Trump ostentatiously dispatched more than 5,000 troops to the border (though he notably avoided strong criticism of Mexico). On November 19th, after the caravan arrived in Tijuana, the United States briefly shut the busy San Ysidro border crossing in California. Amid the noise it is easy to miss the turnaround story of the past decade that “has not at all been grasped by the general public”, says Doris Meissner, a former commissioner of the United States Immigration and Naturalisation Service, now at the Migration Policy Institute in Washington, DC. Not only have the migration numbers tumbled and the share of Mexicans among them dwindled. More Mexicans are now returning to Mexico than are coming to the United States illegally. 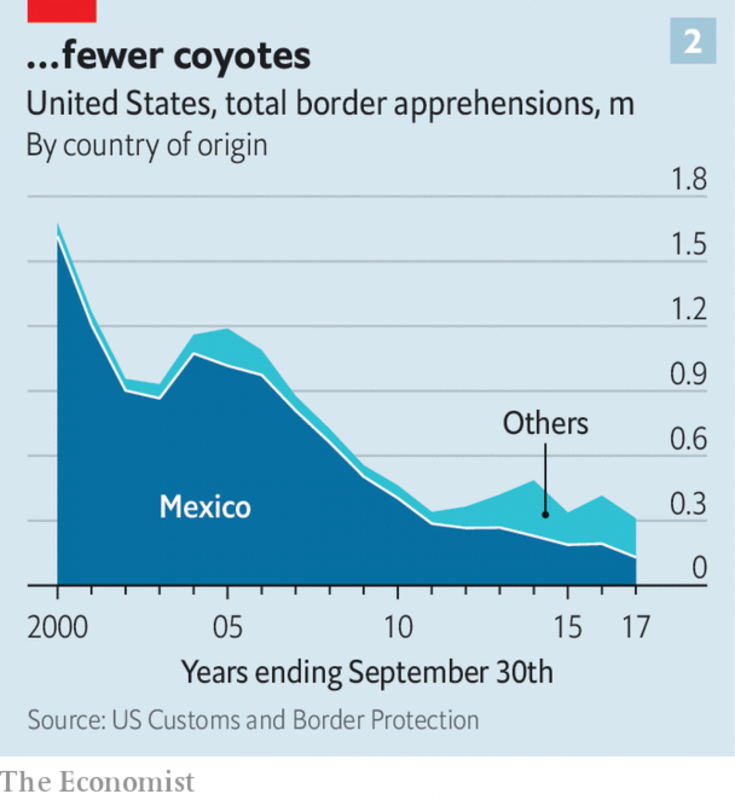 The reasons for this shift are a combination of deterrence (investments in border protection), demography (population growth, which spurred emigration from Mexico, has been slowing) and development (greater economic opportunity at home encourages Mexicans to stay, or return). Mexico’s modernisation is also attracting migrants from its southern neighbours. So it is now at once a sending, transit and destination country. Whereas Mexico once criticised the United States for its harsh treatment of its nationals, it is learning what it means to be a magnet for migrants. It is upping enforcement efforts along its southern border, with the help of American money and technical support. The next step could be a “safe third-country agreement” between the two countries, suggests Mrs Meissner. It would enable migrants who come via Mexico to be sent back for processing there. The Trump administration reportedly plans to force asylum-seekers to stay in Mexico during screening if they are not deemed to face persecution at home. That looks premature. Mexico needs more American help to build a robust asylum system and to keep migrants safe. That is but one example of the sort of collaboration that will be needed if the two countries are to avoid a return to the more distant relationship of the past. “The seeds of both are there,” says Mr Wayne: the good green shoots and the weeds that could take over if relations are not properly tended to. Things could go wrong in several ways. One is a lack of bureaucratic bandwidth. Mr López Obrador’s incoming administration lacks experience in dealing with the United States (though he has picked a sensible foreign minister, Marcelo Ebrard). His effusive letter to Mr Trump may have gone down well with the president, but it did not please some Democrats, whose support will be needed to get the USMCA through Congress. On the American side Mr Trump made his son-in-law, Jared Kushner, his point person on Mexico, but key diplomatic posts remain vacant. Roberta Jacobson, who resigned as ambassador to Mexico in May (and is yet to be replaced), recently described in the New York Times the “disarray” of diplomacy under the Trump administration. Another potential pitfall is that policies clash. Mr López Obrador’s decision to invite Venezuela’s leftist dictator, Nicolás Maduro, to his inauguration points to one area of disagreement. The Mexican president-elect is focused on domestic policies, such as reducing crime, corruption and poverty. 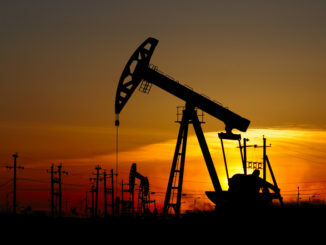 Even before taking office his populist decisions (cancelling Mexico City’s partly built airport, for example) have created fears of unpredictable interventions, especially in oil. It is not hard to imagine other initiatives—his party’s push for the legalisation of recreational cannabis, say—creating tensions with America. And there is the perennial risk from impetuous presidential rhetoric. So far Mr López Obrador has been pragmatic and restrained. But he promised during the campaign to stand up to Mr Trump, and in office there may be occasions when he feels compelled to respond in kind. If so, the danger is of a ratcheting-down of co-operation. For example, Mexico could be tempted to relax its security at its southern border, allowing more migrants through to head north, especially since Mr López Obrador is sympathetic to their plight. A breakdown is not inevitable. The forces driving the United States and Mexico towards a closer relationship will not go away. They include cultural and family connections as well as links between mayors and border regions. And if their intricate government ties can survive the severe tests they have been undergoing, and will surely continue to experience in the Trump-AMLO period, then the relationship could even emerge stronger than ever.